President Obama on Thursday touted some good news about Obamacare. And, lord knows, he’s earned the right. Republicans and conservative intellectuals keep seizing on setbacks—some real, some imagined—and predicting that Obamacare will be a catastrophe. They are almost certainly wrong. Ironically, one of the best reasons to believe in Obamacare may be the very issue that has inspired so much chortling on the right: the insurance premiums for people who buy on their own, because they don't get coverage from an employer or through a government program. Insurers around the country have already submitted bids, describing the kind of policies they initially plan to offer under Obamacare and what they will charge for them. On Thursday, the Department of Health and Human Services released a report analyzing the data from the ten states, plus the District of Columbia, where officials have made at least a portion of the information public. None of the figures are final: Regulators must still approve the bids and, in at least a few states, those regulators are likely to insist carriers go back and offer lower premiums. But the prices shouldn’t change too dramatically between now and October 1, when, in theory, Obamacare’s insurance marketplaces open for business. Assuming the calculations from HHS are correct, the insurer bids are coming in lower than most experts had predicted. That would be a very pleasant surprise. When the Congressional Budget Office made its projections about the law, it basically assumed that the average monthly premium for somebody buying coverage on their own would be $392. 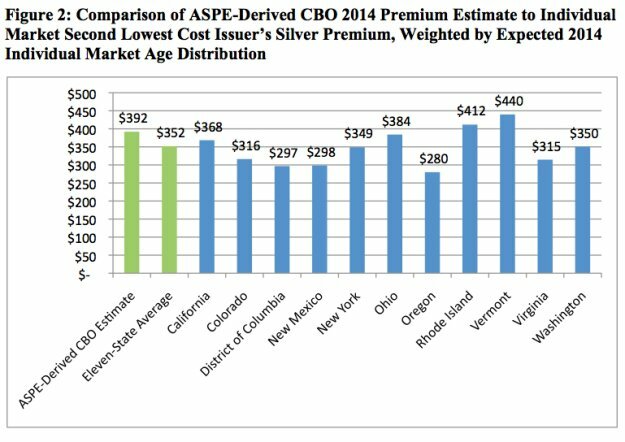 But among those ten states and the District of Columbia, the average premium has been just $352. That’s for the second-cheapest "silver" plan, which means a plan that would be expected to pay for 70 percent of the typical person’s medical expenses. The average price of a "bronze" plan, which would cover only 60 percent of the typical person’s expense, is lower still. Keep in mind that these are merely the premiums that insurers will be charging upfront—the equivalent, in a sense, of a sticker price on a car. They don’t reflect the subsidies that a majority of people buying coverage will get. For some people, those subsidies will discount insurance premiums by thousands of dollars a year. The fact that premium bids seem to be coming in lower than CBO and other experts predicted is a pretty big deal—and not for reasons widely understood. For one thing, it means the overall price of Obamacare—the amount of money the government must spend, in order to make the law function—is going to be even lower than predicted. The reason is those subsidies. The law basically dictates what individuals and families at different income levels will pay for insurance. A reasonably typical middle-class family—two adults, 40 years old each, and two kids, with household income of $50,000, right around the U.S. median—would pay only $3,365 for that second-cheapest silver plan. (I got that figure from the Kaiser Family Foundation’s Subsidy Calculator, which you can try if you’d like.) But the law dictates only what consumers must pay, not what insurers must charge upfront. If insurers come in with really high premiums, then the government will have to issue much larger subsidies to bring prices for consumers back down—and the law, as a result, will become a lot more expensive. The very opposite seems to be happening, at least to this point. The bids also tell us something about the mindset of insurers. The law’s critics and, by the way, quite a few insurance industry officials warned that premiums were going to exceed official expectations. The reason: Insurers couldn’t assume that young and healthy people would sign up for coverage. Without those customers, insurers would be left covering people who were predominantly older and sicker—and, as a result, more likely to run up big medical bills. In response, Obamacare’s defenders—or, more accurately, its believers—argued that the combination of subsidies and the individual mandate would be sufficient to entice enough young, healthy people. They also predicted that insurers, facing the prospect of losing customers to rivals, would opt to keep premiums relativley low. For the moment, at least, the believers’ case looks pretty strong. A brand-new paper from the Robert Wood Johnson Foundation, prepared by Linda Blumberg and John Holahan the Urban Institute, may offer a clue why. The paper suggests that most people buying coverage on their own next year will be as healthy, if not healthier, than the typical person who today gets insurance though a job. Maybe the insurance industry’s own actuaries have, after looking carefully at the figures, come to the same conclusion. So far, insurers are generally assuming that sick people now locked out of the market will enroll, as expected. But they’re also assuming that a lot of young and healthy people will enroll too. Insurance companies are mostly setting premiums like they want to grab market share and be competitive, not like they find the uninsured scary from a business perspective. The Administration’s snapshot remains just that: A glimpse of how things look now, which is not necessarily how they will look in three or six or twelve months. It’s possible the premium bids will be higher in states that aren’t running their own exchanges or where officials are not trying, in good faith, to make the law work. (Why, hello there, Governor Perry.) It’s also possible that insurers are simply bidding too low right now—and that, after a year of selling policies, they’ll raise premiums because they have attracted too many sick beneficiaries. "Premium shock" also looms as a real, though usually exaggerated, threat. Some people buying coverage on their own right now will find their premiums are a lot higher next year—either because they presently have very skimpy plans that Obamacare will prohibit or because they benefit from the discriminatory pricing practices (charging the healthy less than the sick) that Obamacare will end. It’s hard to know exactly how they will react to this new reality: Although they’ll be paying more for their insurance, they’ll be getting better coverage. And they represent a small portion of the population, once you account for the number who will get subsidies or take advantage of other Obamacare provisions, such as expanded Medicaid eligiblity. But, as Kevin Drum likes to point out, this is a big country—and even a small percentage of the population translates to quite a lot of people. The news about Obamacare, in other words, is genuinely encouraging. But there's plenty of work to do, and still plenty of reason for even the law's supporters to remain anxious.